Tiffany Kosch, CenterGate Capital; Kathleen Powers Dunlap, Girls Who Invest, Inc.; Susan Hawkins, BSG Team Ventures; Alexandra Mores, Atlantix Partners (left to right) lead the panel at the Women’s Luncheon. Women are breaking the glass ceiling one crack at a time. Although the climb to gender parity is not as easy in private equity as in other industries, there are signs of progress in this notoriously male-dominated sector. In the last few years, women employees at senior levels have grown to 12.6 percent at PE firms, according to a March 2016 report from Preqin. Given that the U.S. Department of Labor reports that women comprise nearly 50 percent of the work force, there remains a long road ahead. 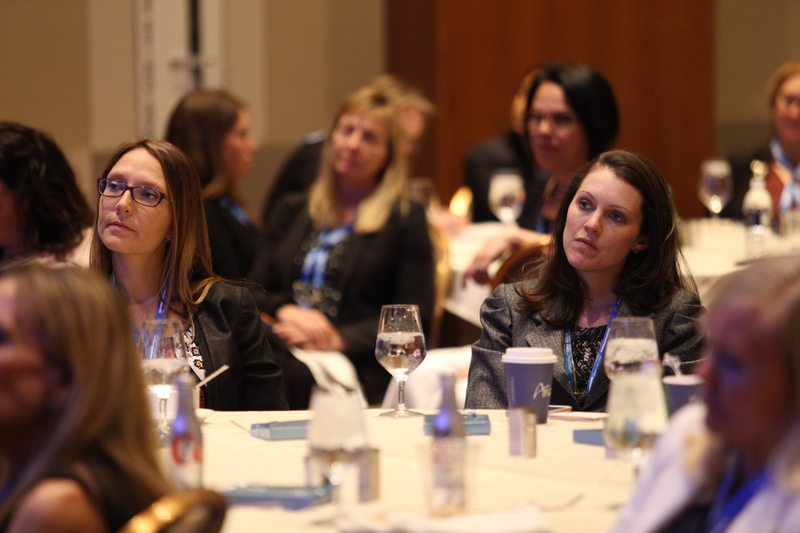 In April, a conversation on the growing role—and inherent challenges—for women in private equity found a home at InterGrowth 2017 in Las Vegas. Among the expanding demographic-focused events at ACG’s premier networking and deal flow conference, the sold-out women’s luncheon and panel discussion, “Expanding the Role of Women in Private Equity,” was among the most popular sessions. The event was hosted by ACG and sponsored by Atlantix Partners, a middle-market consulting firm based in Florida. Alexandra Mores, managing partner and co-founder of Atlantix Partners moderated; other panelists included Susan Hawkins, partner at BSG Team Ventures; and Tiffany Kosch, managing director at CenterGate Capital. According to Preqin, there remains a variance in female representation in private equity, based on firm size and type, with growth by women in senior roles mostly at larger firms. Buyout firms in total have seen representation of women in leadership roles edging down on average for the past two years—to 7.3 percent in 2016 from 7.5 percent in 2015; in 2014, they represented 9 percent on average. Industry insiders hope to reverse that trend. “There has been movement among middle-market private equity firms with respect to implementing initiatives that target both recruiting and retaining women within their firms,” BSG’s Hawkins told MMG in an interview, noting strategies such as setting goals for women and diversity hiring, training in-house staff about unconscious bias in recruiting, and supporting onboarding and employment practices that enhance retention. ACG plans to continue the discourse on women’s professional roles, helping to broaden roles for women who are working in private equity or looking to break into the industry, with additional women-focused events. Demand for more events about women’s role in private equity is becoming more apparent. “Women-focused events create productive, fluid networking opportunities for professional women. Near-term, women network with one another to exchange business opportunities in an inviting, effortless setting,” said Lindsay Burton, founder and president of the Kayo Conference Series. The organization creates women-in-PE-focused events throughout the country. Kristin Gomez is VP of communications and marketing for ACG Global.